A well-bred West Virginia bride begins the adventure of her life when she marries a young Montana rancher who takes her back to share his life among the cowboys. 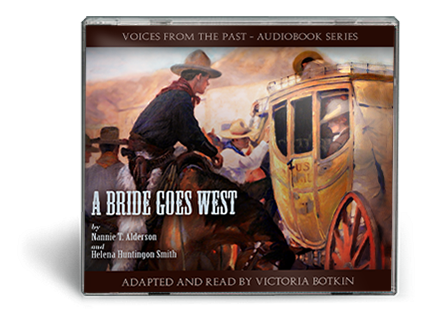 Follow Nannie’s adventures in adapting, with grace and pluck, to her new life in the Wild West – as one of the few white women there, trying to bring civilization to the range amidst a host of rowdy cowboys, Indians, and outlaws. Colorful and unforgettable characters, cattle roundups, bucking broncos, Indian attacks, and pioneer spirit make this a thrilling Wild-West-show of a story. Nannie T. Alderson’s tale is a true story of honor, courage, resourcefulness, and faith on the range. Adapted and read by Victoria Botkin, music by Elizabeth Botkin, sound design by Lucas Botkin.